It has been an interesting and exciting week at Hensington Palace. First the good news. Our little purebred Australorp pullet laid her first egg on Friday morning! I was so happy and proud to see it. I’ve raised this little girl from egg to egg layer and was so pleased to find her little gift under the roosting perch. She has laid each day since then, one smallish, perfectly formed brown shelled egg each day like clockwork. In other, not so great news, our problem crossbred layer hen is having laying issues once again. She had been doing so well, and I was beginning to hope that all her troubles were behind her. For those who haven’t been longtime followers of this blog, I will recap. We got this hen as one of our two original laying hens back in 2011 as a gift for mother’s day from my children. Neither of them was laying yet when they first arrived. They were little, cute POL hens and we eagerly awaited our first eggs from them. It seemed to take forever for them to finally lay, because we got them in winter and they didn’t start laying until the spring. Anyway, eventually they did both start to lay, but before too long, “Bossie” as we had named the black hen, began to have trouble. It started off with a nasty prolapse. I was horrified the morning I went to the coop and found the poor girl with her bottom all red, and seemingly turned inside out. I put her in isolation and sent out an urgent message to a chook owning friend, asking what I ought to do. I was told that if the situation didn’t revert by itself, the alternatives were vet treatment, or culling. My heart was heavy. I didn’t want to have to destroy my lovely little hen so soon after getting her! Fortunately, with a little time alone to rest and be quiet, the prolapse reverted of its own accord. Bossie had one more prolapse after that, a few days later, but it was less severe and reverted as soon as I picked her up. She seemed well after that, but a couple of months later, I started to find broken eggs in the nesting box each morning. At first, I thought the hens must have developed a habit of egg eating. (A big no no in laying coops!) but then I realised that these eggs had very thin, brittle shells. Again, it was Bossie that produced these flimsy shells. The advice for this situation was to insure that the hens were getting enough shell grit (for calcium) and sunshine (vitamin D) both of which they were getting plenty of, being free range hens, and also having a dish of shell grit available free choice in the coop. Another piece of advice was to try and get boss to stop laying, to give her system a break and reset everything. I tried everything I could, but Bossie is a commercial hybrid and is programmed to lay, lay, lay… She did not go off lay even for one day, despite my best efforts. 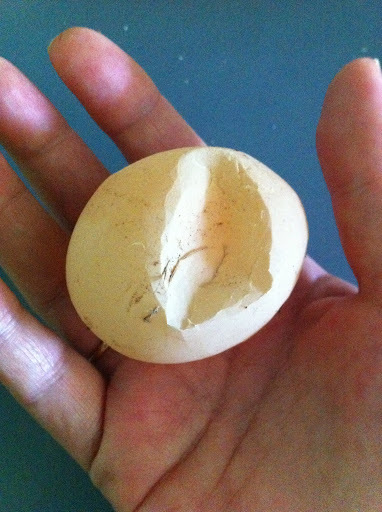 She did, however start laying hard shelled eggs again and I finally thought her troubles were behind her. Alas, this morning, I found another soft shelled egg under the roost. She usually always lays in the nest, so I think this egg may have ‘slipped’ out while she was sleeping last night. As you can see from the image, this shell is very thin and brittle. I was able to make an indent in it by gently pressing my thumb against it. If I’d pressed any harder, the shell would have ruptured. That is the biggest problem with such eggs. The shell of an egg is subjected to a lot of pressure as it passes through a hen’s body to emerge from the cloacca. Should the shell break before the hen is able to pass the egg, this will lead to a painful and fatal infection called Egg-Yolk Peritonitis. It is dangerous for a hen to be afflicted by soft shell problems as she can get into dire straits! My decision now, is whether I try to fix this, whilst running the very real risk that she will wind up with peritonitis, or do I write her off as high risk and cull her. It’s not an easy decision to make, but I need to consider the hen’s welfare as well as my own feelings about this. I already think I’ve made the decision. It’s just not going to be easy. This entry was posted in Australia, Chickens, Self Sufficiency and tagged Australorp, chickens, eggs, hensington palace hens, soft shelled egg. Bookmark the permalink. ← Meal Worm Rescue and a "Beakicure"
Maggie – What a tough decision. My Daisy has the same problem. She stopped laying during the winter, and I was hoping this would help her regain the calcium stores she would need. But when she began laying again last month, the shells were thin again. I have been hand-feeding extra calcium to Daisy on a daily basis — three raisins, which I split open, dip the sticky part in oyster shell grit, then stick them back together again. She gobbles them down, and it has been a great success so far. I know that most chicken-folk don’t have the kind of time to care for a chicken in that way, however, and I believe that whatever choice you make is going to be the right one. That’s the challenge of animal husbandry. 🙂 Beautiful blog, Maggie — I just found you through Poultry Matters on FB, and I will be back! I like your idea using raisins to give extra calcium, too. I will keep that one in mind!